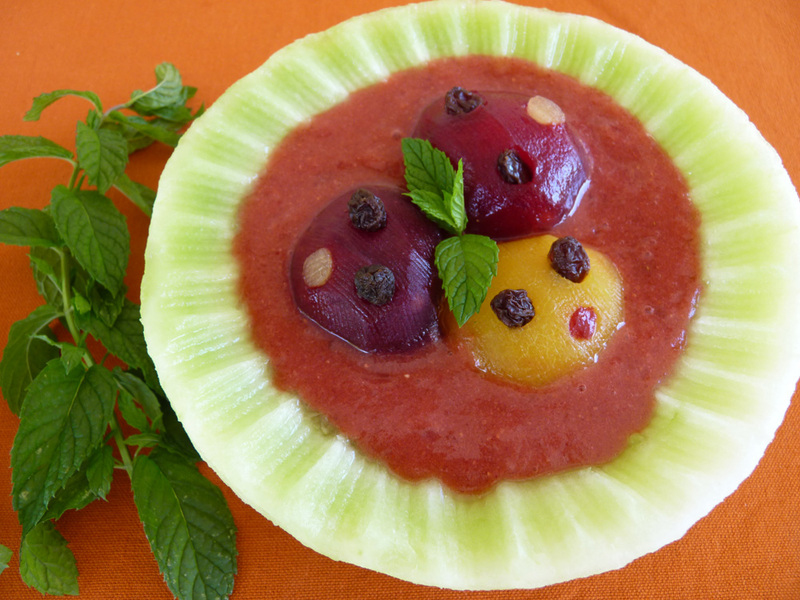 The all-fruit bowl is edible, and includes a variety of textures to satisfy any palate. Hollow out the peeled honeydew, shaping it as a bowl. You can carve the edges if you prefer, or leave them plain. Peel 3 plums, remove the pits by making a small section cut, and place the plums in a honeydew bowl with the cuts down. Make small indentations for eyes and mouths, and insert the raisins. In a high-speed blender, blend chopped dates and strawberries, and pour into a bowl around the plums. Garnish with a sprig of mint, and serve. Note: Preparation time is 15 minutes plus soaking time.